I was moved to return to this blog after an excruciatingly-long absence after reading a very thought-provoking article over at ScreenRant about the latest Star Wars movie, Rogue One. SPOILERS IN BOTH THE SCREENRANT ARTICLE AND IN THE POST BELOW. In Rogue One, which ends barely minutes before the events of A New Hope, we saw a couple of familiar characters, who were absolutely necessary in order to fully tell this part of the story. One was Darth Vader, still ably voiced by the one and only James Earl Jones. 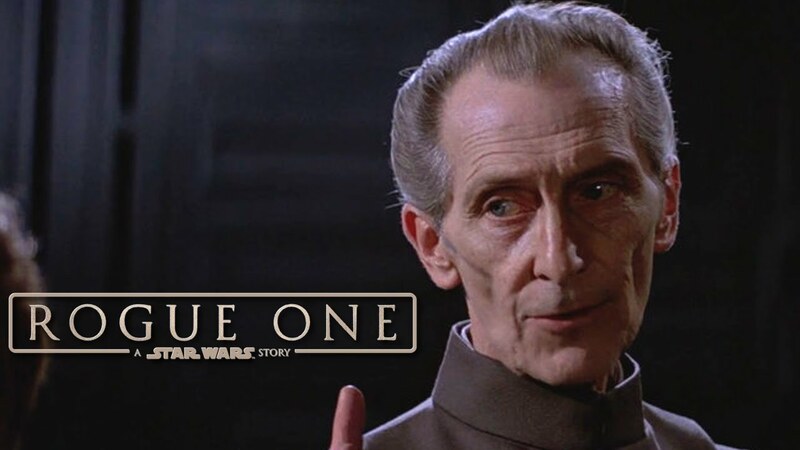 The other was Grand Moff Tarkin, who was originally played by the late Peter Cushing. I still remember the first moment we saw Tarkin on board the Death Star in Rogue One, his back to the camera, his face merely reflected in the window before him. I remember thinking at the time, “Well, this makes sense. He obviously needs to be here. Good filming choice, given that that’s certainly not Peter Cushing.” And then Tarkin turned around to face the camera. And thus lies the dilemma. Having lost Carrie Fisher just a couple of weeks ago, Disney and co. are now faced with the question of how to finish Leia Organa’s story without the person who brought her to life. We did also see just a glimpse of Leia at the end of Rogue One, also delivered digitally. However, that was a very brief moment, with just a sentence of dialogue, and with plenty of emotional buildup to entice the viewer to connect immediately. After all, the shot swept up on Leia–also facing away from the camera–wearing the signature white dress, hair in the trademark buns, and we were swept up along with the camera to that beautiful, hopeful shot of her face as it filled the screen. Sadly, I learned later that the actress standing in Leia’s shoes was not Carrie Fisher but someone else entirely. I absolutely shared Fisher’s distress that she couldn’t be chosen to play herself because she had aged too much. And now that she is no longer with us–and knowing that Leia’s story was meant to continue in episode 9–we have to wonder what will be done. Do we really want to see an entire character’s story told via CGI? Especially when it’s the end of a massive story arc? Even when it’s well done, how much CGI is too much? Believe me, I’m very thankful that Fisher had finished filming episode 8 before she left us. And I’m torn between appreciation for the high quality of digital art and the moral implications of basically masking another actor so as to digitally resurrect someone else. To me, Star Wars is an anomaly in that this is a story that’s been in motion since 1977. That’s absolutely unheard of in film. Even at the beginning, nobody could have foreseen the dilemma the franchise is currently facing. But now, in an era where so much is mind-bogglingly possible, we have to wonder how this will affect storytelling in the future. What did you think of Rogue One? What other examples of digital acting have you seen? I’d love to know what you think. Previous Post Previous post: Only Random Acts Could Get Me To Try My First 5K!